I’m not sure what happened but I massively over-ordered on desiccated coconut this past Pesach. I don’t think I even had anything in mind for it, but I had 3 big bags leftover – oops! And of course the best before dates are about a month before Pesach next year so I can’t even put them away… urrrgh. It’s nearly Rosh Hashanah already so there’s nothing else for it – better get baking. I was really pleased with how these coconut cranberry oatmeal cookies came out. The coconut is subtle, but definitely there, and the tangy-sweet cranberry flavour is a perfect compliment. The texture is deliciously chewy and soft inside, with a slightly crisp exterior. Perfect with a cup of tea! I was also pleased to realise that unlike my muesli cookies or nutella shortbread, these delightful morsels contain no nuts and so will be a lunchbox friendly treat for Kipper to take to school in a few weeks. Excellent. The morning when I made these cookies was doubly productive, because as well as a batch of lovely coconut cranberry oatmeal cookies I also took loads of photos which enabled me to make this video, which will show you just how simple these fabulous cookies are to make 😀. 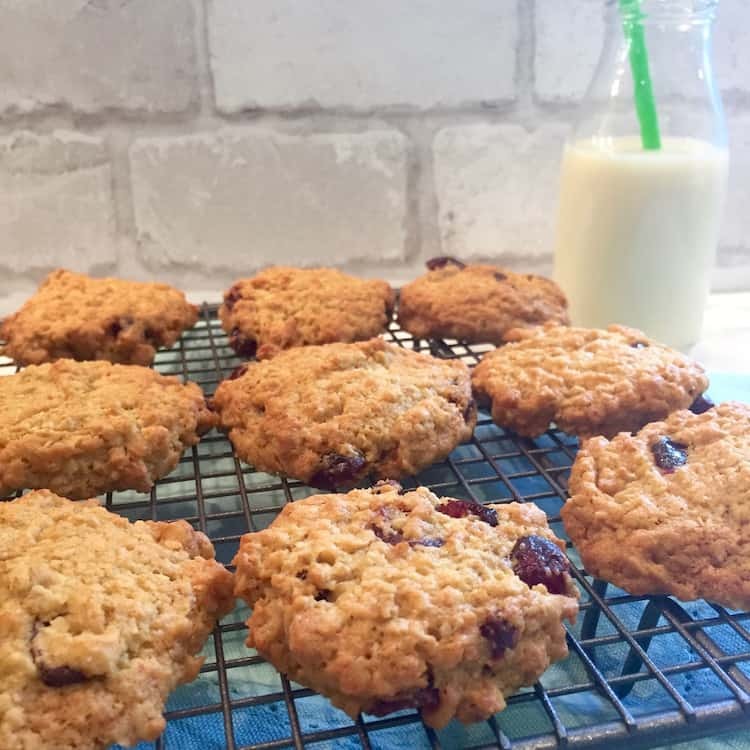 Crispy outside and chewy in the middle, these delicious oatmeal cookies are flavoured with coconut and dried cranberries for extra deliciousness! Preheat the oven to 185C. Line two baking sheets with greaseproof paper. Cream the margarine (or butter) with the sugar until fluffy. Add the egg and beat well to combine. Add the flour, oats, bicarb and coconut and mix well to give a soft dough. Stir in the dried cranberries until evenly distributed. Place tablespoons of the mixture, spaced well apart, on the prepared baking sheets. You should get around 20 cookies. Bake at 185C for around 5-6 minutes, then squash each cookie gently with a fork to encourage it to spread. Return to the oven and bake for another 5-6 minutes until golden brown. baked, baking, child-friendly, coconut, cookies, cranberries, easy, oats, vegetarian. Bookmark. These are so my kind of cookie and i am certainly with you on the “cranberries for all year”. Thanks Julie! I’ll accept the compliment regardless of what capacity you’re commenting in! Oooh these cookies look delicious. I love coconut and they sound amazing with cranberries! Thanks Kate! Coconut and cranberry is one of my favourite combinations. Those look delicious Helen! Chewy, coconutty cookies with dried cranberries are right up my street – yum. Anything with cranberry reminds me of Christmas, but I think these cookies would be good any time of year. They look really good. I love cranberries! Someone should start a ‘cranberries all year!‘ campaign! !